On 12 September, the Czech firearms maker Česká zbrojovka (CZ) officially announced a new, 7.62 NATO (i.e. 7.62 x 51 mm) version of its BREN 2 assault rifle, i.e. BREN 2 BR. CZ states that the BREN 2 BR retains “the assets of the CZ BREN 2 series”, but is chambered for 7.62 NATO. In other words, the BREN 2 BR is the BREN 2 chambered for 7.62 NATO (i.e. the same rifle platform). 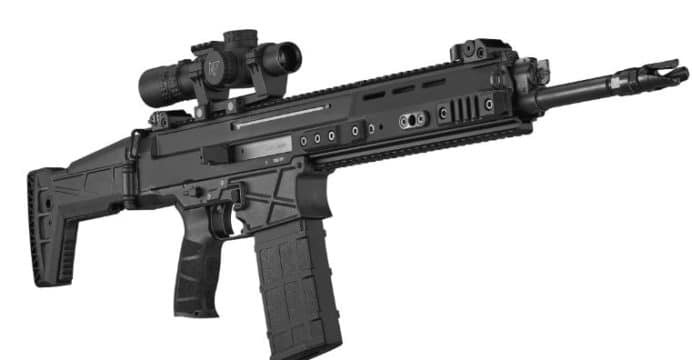 CZ will position the BREN 2 BR as an alternative to the FN Herstal SCAR H, AK-308, Beretta ARX-200 and other contemporary 7.62 NATO assault rifles. However, CZ has yet to reveal the BREN 2 BR’s weight, but its official listing shows that the rifle has a barrel length of 407 mm and overall length of 925 to 995 mm. According to CZ, the BREN 2 BR uses MIL-STD-1913 Picatinny rail for accessories, such as forward vertical-grips, optics and under-barrel grenade launchers (UBGL). Interestingly, The Firearms Blog (TFB) reported that in 2016, the Pakistan Army had trialed an early version of the CZ BREN 2 BR. According to TFB, the BREN 2 BR – when using .308 Winchester ammunition (i.e. 7.62 NATO’s commercial predecessor) – the BREN 2 BR “was very accurate.” Pakistan also test-fired the CZ-807 in 7.62×39 (i.e. the same ammunition caliber as the AK-47). In November 2016, Pakistan Ordnance Factories (POF) signed a letter-of-understanding (LoU) with CZ to negotiate “a delivery of complete technology for the production of small arms [to POF]” with the focus of achieving “light assembly to maximum localization of production.” The LoU was confirmed by a CZ official in April 2017. However, it does not appear that POF and CZ made tangible progress on that front. That aside, CZ now has a complete small arms portfolio. In addition to the BREN 2 BR (7.62 NATO), CZ also has the 7.62×39 mm CZ-807, 9×19 mm Scorpion Evo 3-series sub-machine gun (SMG), 7.62 NATO TSR (Tactical Sniper Rifle) and a range of sidearms, including CZ-75, CZ-97 and CZ P10.